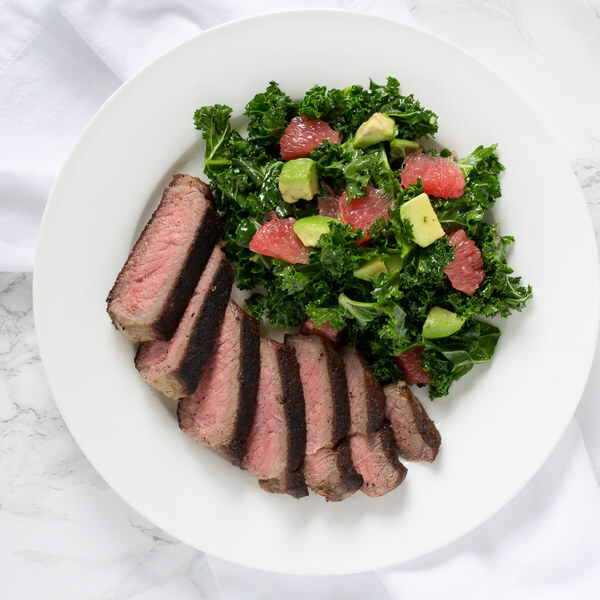 ← Pan-Fried Striploin Steak with Kale, Avocado & Grapefruit Salad. Cut out and discard the kale stems; cut the leaves into 1-inch pieces. Transfer to a large salad bowl. Drizzle the kale with olive oil and season with salt and pepper. Massage the kale with your hands until the leaves are evenly coated with the oil and begin to become more tender, 1 to 2 minutes. Set aside. Preheat a skillet over medium-high heat. While the skillet heats up, pat the steak dry with paper towels and place on a plate; season generously with salt and pepper on both sides. Once the skillet is hot, add coconut oil and swirl to coat the bottom. Carefully place the steak in the skillet; flipping every 15 to 30 seconds, cook the steak until desired doneness (5 to 7 minutes for medium-rare). (Use a thermometer or cut into the steak to check the doneness.) Once done, transfer the steak to a plate and let it rest for 5 to 10 minutes. Halve the avocado lengthwise and twist the halves to separate, then remove the pit with a knife or spoon; scoop out and large dice the avocado flesh into ¾-inch cubes. Add to the salad bowl with the kale. Slice off a piece from both grapefruit ends, then place it flat on one of the ends and slice off the peel (from top to bottom), exposing the flesh; cut out the segments of flesh from between the membranes, then cut them into ¾-inch pieces. Add the pieces (and any leftover juice) to the salad bowl. Toss the salad until well combined. Slice the steak against the grain into strips. To serve, divide the salad and steak between plates. Enjoy!